Laura Amy Schlitz is the author of the Newbery winner Good Masters! Sweet Ladies! Voices from a Medieval Village. She is the author of one of my favorite books, A Drowned Maiden's Hair: A Melodrama, that reads a bit like a Gothic Anne of Green Gables if an had been adopted by a trio of elderly sisters who pretend to be clairvoyants, preying on wealthy patrons who have lost loved ones. 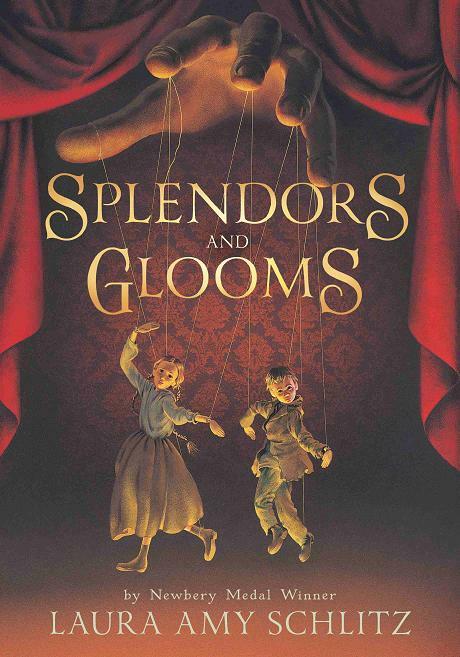 Her new book, Splendors and Glooms, the title taken from a line of Shelley's poem Adonais, is magnificent. Set in London in the fog of autumn, 1860, the story is as gloomy and grim as the sooty Industrial era city it is set in, but it is also bright with characters who are complexly developed, flawed and, while not always likable, completely compelling. I read Splendors and Glooms slowly, savoring the story. Loss is at the heart of every character in this Dickensian novel. When the story begins, it is November 6th, the day of Clara Wintermute's twelfth birthday. Yet, it is clear from the start that this is a child who lives a life of repression and quietude. As the story unfolds, we learn that Clara was once one of five children. Her siblings, including her twin brother Charles Augustus, died five years ago from cholera after eating tainted watercress. Clara escaped the same fate because she refused to eat her watercress, but she is also keeping a dark secret that she carries with her, making her obedient to her mother's grim insistence that they keep mourning continually. Their house is crowded with portraits, death masks and funeral photos of the dead Wintermute children and every holiday Mrs Wintermute insists they visit the family mausoleum and Kensal Green. A chance encounter in the park with puppeteer Gaspare Grissini and his Venetian fantoccini and the crying of extremely rare tears on her part bring the shabby man and his young assistants into the Wimtermute home to perform for the guests at Clara's birthday party. Enchanted by Lizzie Rose and Parsefall, Grissini's helpers, Clara arranges to have tea with them before they set up for their show. A bond is formed between the three, although none of them realize it, a connection that will play itself out in various ways as the novel unfolds. Unbeknownst to Lizzie Rose and Parsefall (true to his name, Parsefall is an innocent who is meant to steal a valuable relic) Grissini is a wicked magician who kidnaps children from wealthy families, enchants them into puppet form then, after retrieving the ransom, returns them home, broken shells of their former selves. This is to be the fate of Clara Wintermute until, on the very night that he is to meet Dr Wintermute (in disguise) in the family mausoleum, he is called forth to the home of a more powerful witch whom he once pretended to love in order to steal her power from her. Cassandra Sargedo, the elderly witch we first meet in the prologue, is in possession of a fire opal that is threatening to end her life in the midst of fever and flames like those women who possessed it before her. But, some forty years ago before they parted for a final time and she put a powerful curse on him, Grissini was on the verge of telling her how to break the spell of the fire opal. Grissini disappears to the north of England in the middle of the night after falling down a flight of stairs and appearing to be dead. Lizzie Rose and Parsefall are delighted to be free of him, but quickly fall into almost as bad straits as when they were under Grissini's "care." Their landlady, the slovenly, gin loving Mrs Pinchbeck (a widow who once acted on the stage and never lets a dramatic moment pass without overacting it) allows them to continue on in their rooms but turns Lizzie Rose into an indentured servant of sorts, at the mercy of Mrs Pinchbeck's odious stepson who makes unseemly advances toward Lizzie Rose whenever he visits. Parsefall, almost as good at the puppets as Grissini, takes their trunk out and performs when he can, but this leads to trouble as well. A letter from a mysterious benefactor addressed to Grissini and a trove of pick-pocketed valuables that the children discover hidden in his mattress lead to a fantastic evening out - a sumptuous meal and a visit to Egyptian Hall to see the Royal Marionettes - and a train ride north to an unknown woman who promises to lift them out of the mire and tangle their lives have become. The Wolves of Wiloughby Chase. I think I was under the illusion that I had found this one on my own, but now that I see the review, I realize that it was yet another amazing recommendation of yours. This was a big hit for the three of us -- gorgeous writing and lots of suspense. It was a bit creepy for Ella (9) at times, but not too bad, and I could gloss some of it over on the fly. Grisini was a most-excellent villain and we loved the Snape-like ambiguity of the witch's character -- she reminded us of Miyazaki's elderly witches in Spirited Away and Howl's Moving Castle -- so compelling and complicated. Fantastic! I love the parallel of the witch and Miyazaki's elderly witches! So glad to hear you appreciated this book. Amazing as it is, I recognize that it's not for everybody. It takes a special type to enjoy it!